DA Motor Fittings are an independently owned company, established in 1970, specialising in bespoke and purpose built commercial vehicles and van interior conversions. These types of conversion are commonly used for work gangs with a various of uses. They are also used by the rail industry, motorway and highway maintenance, utilities, hire and leasing companies for their clients that require these on-site provisions for their work teams. These types of conversion are designed around the customers intended use for the vehicle. 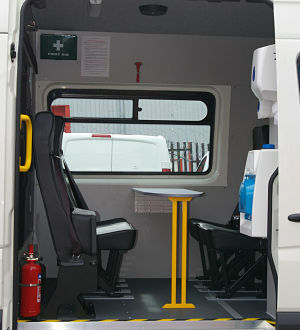 With a very large range of designs they can be a one off conversion to a large fleet of conversions. These types of bespoke designs are commonly used by all areas of commerce and private use. 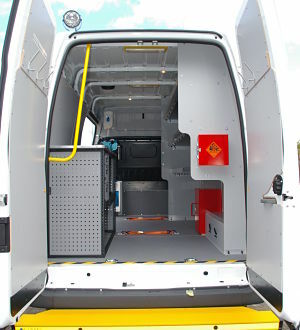 Any combinations can be used, dependent on what the customer wants to carry or use the vehicle for. 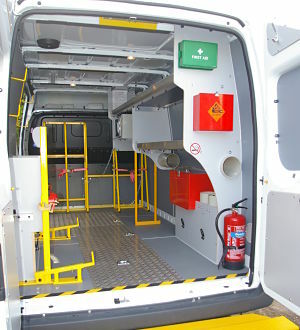 The interior can be designed around the requirements of the job the van is intended to do. By building in the required storage solutions ensures maximum efficiency of the conversion. 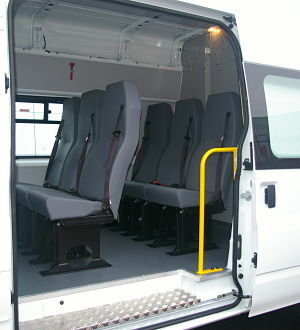 Basic seated van conversions, seats - windows and ply lining. A low cost option to convert a van to carry additional persons, or create a dual purpose vehicle for the plumber - electrician or builder. To be able to carry his tools, use his van for pleasure or to carry his colleagues.